Indian marries strongly on the basis of Kundali Milan or horoscope matching. Amidst Hindus, it is considered the most crucial step before the final commitment to the prospective spouse. With modernization, many do not believe in this horoscope matching ritual. What-so-ever, a large section of Indians still get their daughter or son married only after the ‘gunas’ are matched perfectly. But what underlies behind this kundali matching custom? Read on for the reveal. Hindus believe that marriage is a sacred union of the couple not only for this life but for the next seven successive lifetimes. It is indeed a holy affair. Horoscope in this scenario reflects the planet positions of a person and their effects on life. As per Hindu Shastras, nature considers man and women as single entity post marriage. The destiny, luck and fate of the both influence each other. Therefore, there is a 50-50 chance. It can either create wonders or lead to a bad relationship. This is the main reason as to why kundali milan plays a vital role in decoding the marriage compatibility of two souls. ‘Guna’ or ‘Ashtakoot’ is another parameter that is taken into consideration while matching a kundali. There are a total of eight gunas that are taken into account to test the amity between two people. Again, each individual guna has different numeric points which when added, sum up to a total of 36. A couple is declared compatible if both their kundalis match with 18 and more points. Higher the score, better the compatibility. Financial stability is what every parents look for. Therefore, kundali helps a great deal to help you predict the job prospective in the near future and if there are any chances of promotion as well. The adjustment parameter of both the couple is checked beforehand so that marital harmony is maintained. It tells whether the couple can adapt to changing situations or not. 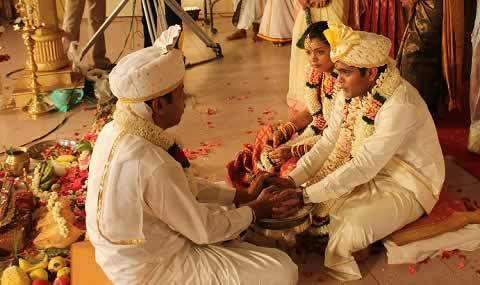 Kundali Milan predicts the mindset, behavior, temper, interest and aptitude of both the partners for a happy marriage. The level of physical attraction is also tested as no marriage can survive without sexual attraction for each other. The health condition of to-be bride and groom is also an important point to be considered. Previous PostCreative Ways To Re-Use Your Wedding LehengaNext PostWhere to Buy Wedding Lehengas for Brides in Delhi! You forgot to mention about one more term in Kundali Matching. That is Ashtakwarga which is also known as Indian Numerology. There are more things in horoscope for matching but Navmansh and Hora Chakra are important & should be considered for horoscope match.